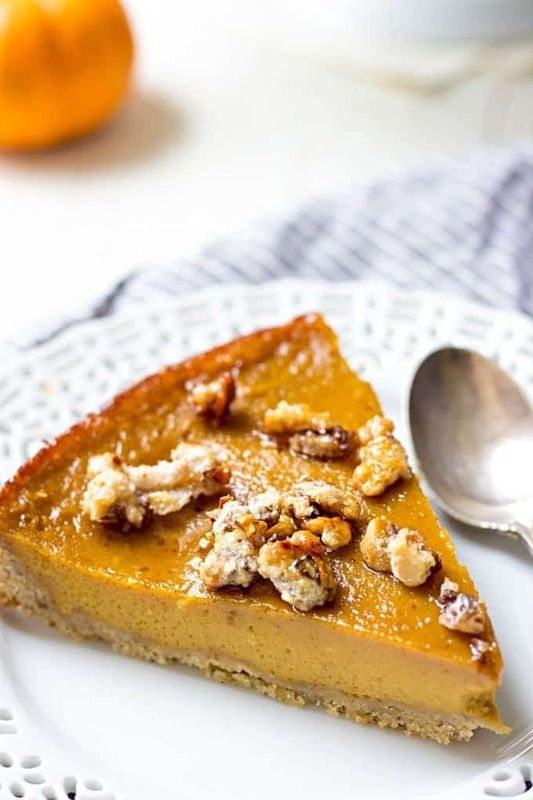 It’s time to take your favorite Pumpkin Pie to the next level. 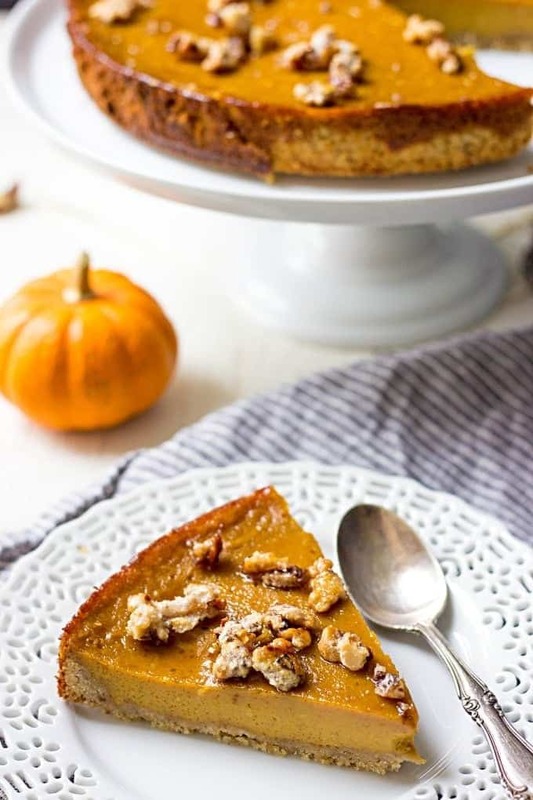 Crispy and extremely flavorful hazelnut crust and sweet caramel pumpkin filling will make you crave this easy pie all year round. It’s absolutely scrumptious. Can you believe I’ve never made a pumpkin pie before? Despite its being the main dessert over Thanksgiving table, I always chose some other sweet treats. 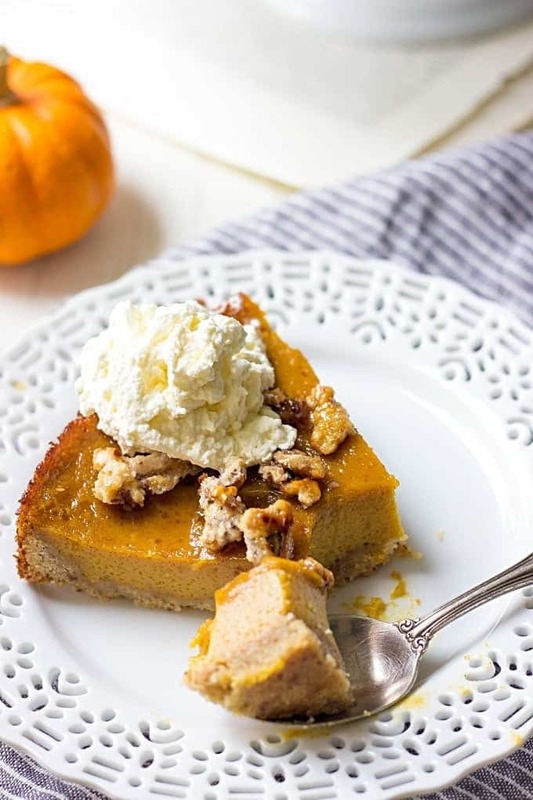 But a couple weeks ago, as I was flipping pages of last year’s issue of Bon Appetit, I noticed one pumpkin pie recipe that immediately caught my attention. Unlike the regular shortcrust, this one contained a large portion of hazelnuts. And unlike a regular pumpkin puree filling, this recipe called for caramel, and a pumpkin puree. And who doesn’t love caramel? If I could I would top each dessert with a little bit of caramel sauce. When I was making the dough, I had to literally pause a couple times to smell my fingers. No joke, roasted hazelnuts made my hands smell sooo good. Hazelnut crust gives this pie a nice nutty flavor. Pumpkin and caramel filling is too addicting. And caramelised hazelnuts are like finger foods, you can’t stop eating them. I loved the recipe called for a little bit of fresh grated ginger. It gave the filling a little spicy kick, which I really enjoyed. Place hazelnuts on rimmed baking dish and toast for 8-10 minutes. Let them cool. Using kitchen towel, rub hazelnuts between the towel to easily remove most of the skin. Some skin will stay and that's okay. In a bowl of standing mixer, combine ¾ cup of hazelnuts, flour, sugar and salt. Pulse for a few times. Add butter and pulse until the mixture is the texture of coarse crumbs. While the mixer is running, add 3 tablespoons of water and pulse until the dough forms into a ball. Using your fingers press dough 1½" - 2" up the sides into a parchment lined 9" springform pan. Remove from the fridge and bake for 15-20 minutes until crust is slightly underbaked. in a medium and over medium heat, bring cream of tartar, 1 cup of sugar and 2 tablespoons of water to a boil. Stir occasionally. Increase heat to medium high and cook swirling the mixture from time to time until it becomes deep amber in colour, about 8-10 minutes. Don't overcook! Remove from the heat and whisking constantly, very carefully pour in heavy cream. Mixture would very hot. Whisk until smooth and set aside. In a medium bowl combine pumpkin puree, cinnamon, ginger, brown sugar, salt, flour and eggs. Mix well and gradually add caramel sauce. Whisk until combined and pour the mixture into prebaked crust and bake another 30-35 minutes until the edges are set but the center of the pie is barely jiggles. Meanwhile, chop the remaining ½ cups of hazelnuts. In a small non-stick pan combine ¼ cup of sugar, 1 tablespoons of water and hazelnuts. Cook on a medium heat until nuts start to caramelise. Transfer on a parchment paper to cool. Roughly chop the hazelnuts and scatter them over the pie.